Locally and globally, there is growing recognition of the critical roles that herring, smelt, sand lance, eulachon, and other forage fishes play in marine ecosystems. Scientific and resource management entities throughout the Salish Sea, agree that extensive information gaps exist, both in basic biological knowledge and parameters critical to fishery management. Communication and collaboration among researchers also is inadequate. Building on the interest and enthusiasm generated by recent forage fish workshops and symposia around the region, the 2012 Research Symposium on the Conservation and Ecology of Marine Forage Fishes was designed to elucidate practical recommendations for science and policy needs and actions, and spur further collaboration in support for the precautionary management of forage fish. This dynamic and productive event was a joint venture of the Northwest Straits Commission Forage Fish Program, U.S. Geological Survey (USGS), Washington Department of Fish and Wildlife (WDFW), and The Puget Sound Partnership. The symposium was held on September 12–14, 2012, at the University of Washington, Friday Harbor Laboratories campus. Sixty scientists, graduate students, and fisheries policy experts convened; showcasing ongoing research, conservation, and management efforts targeting forage fish from regional and national perspectives. The primary objectives of this event were to: (1) review current research and management related to marine forage fish species; and (2) identify priority science and policy needs and actions for Washington, British Columbia, and the entire West Coast. 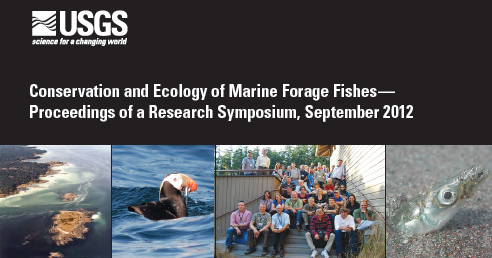 Given the diversity of knowledge, interests, and disciplines surrounding forage fish on both sides of the international border, the organizing committee made a concerted effort to contact many additional experts who, although unable to attend, provided valuable insights and ideas to the symposium structure and discussions. The value of the symposium format was highlighted in the closing remarks delivered by Joseph Gaydos, SeaDoc Society and Chair of the Puget Sound Science Panel. Dr. Gaydos’ presentation referenced the 2011 paper by Murray Rudd in the journal Conservation Biology, “How research-prioritization exercises affect conservation policy.” The paper points out that policy makers and funding agencies are more likely to gain a full understanding of issues when they are presented with research findings from an aligned research program. That is, compared to unaligned research strategies, where work is not based on identified research priorities. Liedtke, Theresa, Gibson, Caroline, Lowry, Dayv, and Fagergren, Duane, eds., 2013, Conservation and Ecology of Marine Forage Fishes—Proceedings of a Research Symposium, September 2012: U.S. Geological Survey Open-File Report 2013-1035, 24 p.